The Faith Advisory Council is designed to bring individuals together from a variety of faith communities interested in the needs of Haiti. The council meets on Saturday morning a few times a year. A light breakfast is served. People are encouraged to bring their stories of individual projects or ideas for getting involved in Haiti. 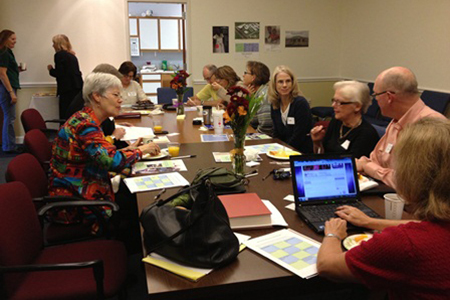 Guest speakers include authors, in-country missionaries, and project leaders from Haiti. Group and organizational collaboration is encouraged. Topics have included mission travel, program development, best practices in healthcare delivery, Haitian culture and diversity. It is a time to encourage group activities and support of the many Triangle organizations working in Haiti. Many of the people involved in the Faith Advisory Committee have worked in Haiti for years and have a wealth of knowledge and expertise to share. For more information, contact FHM Board Members Nancy Holton or Susan Rogers, or call the FHM office at 919-382-5500. 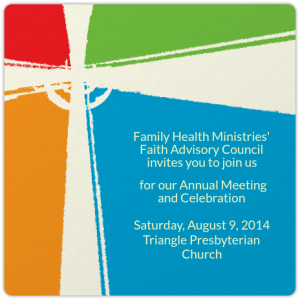 The Faith Community Advisory Council will meet Saturday, August 9, 2014 from 9:30am – 11:30am at Triangle Presbyterian Church. All who are interested in learning more about FHM and participating on the Faith Community Advisory Council are welcome to join us. Click HERE to find out more about this event.